When I was a kid my Mom used to make wonderful sweet treats for me and my sister. 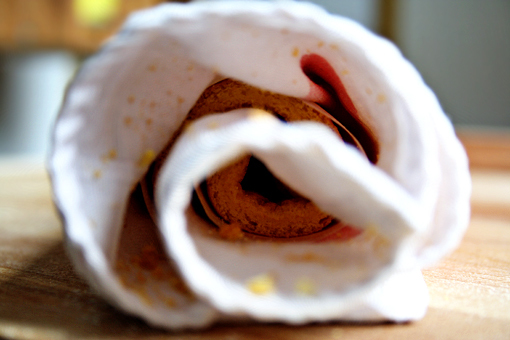 One of the desserts she used to prepare most often was this strawberry roulade. I guess she liked to make it because it is amazingly simple and easy. Hm, who doesn’t like that? 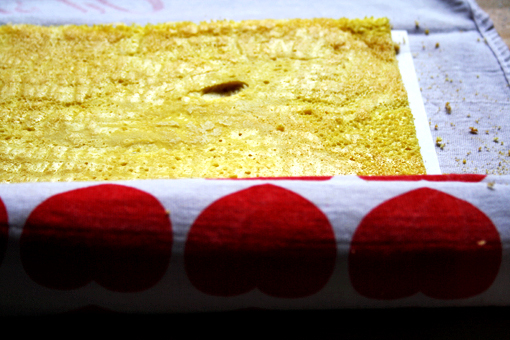 As I’m spending time here in my Mom’s house these day, it’s no surprise there’s been a lot of remembering the old, sweet days of my childhood …which magically gave me the idea to prepare this delicious cake, since, to my surprise, I’ve never made it myself. 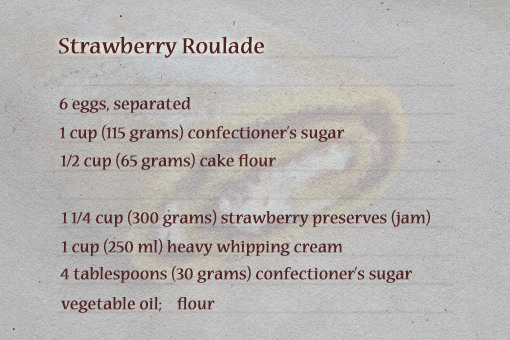 These are the ingredients you need in case you want to prepare this delicious cake, too. 1. First, preheat the oven to 356 F (180 C). 2. Then, separate the eggs. 3. 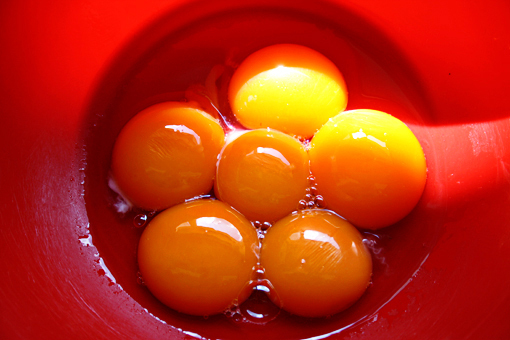 Now, play with the yolks a little. 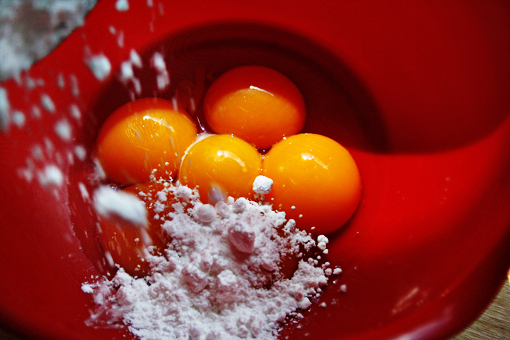 Add 1 cup (115 grams) confectioner’s sugar to the bowl with the egg yolks. 4. 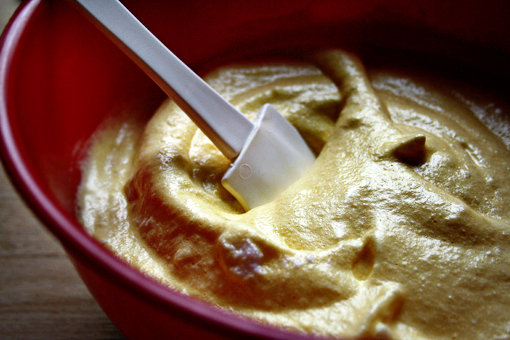 Using your hand mixer, whisk the egg yolks and sugar until pale yellow and fluffy. 5. Add the flour and mix again shortly, just until incorporated. 6. 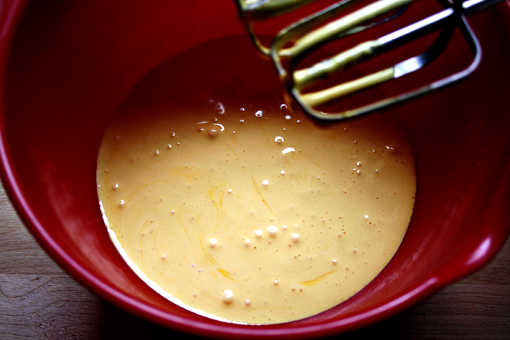 Then, in a separate bowl, whisk the egg whites until firm (stiff peaks) and add them to the egg-yolk mixture. 7. 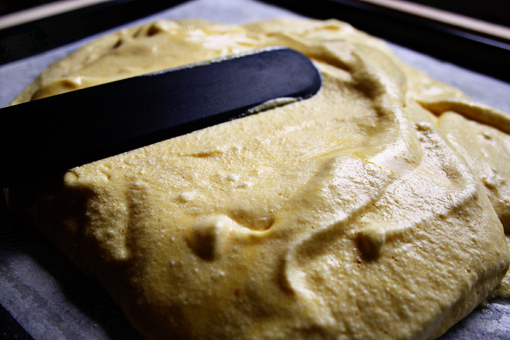 Using a rubber spatula, gently fold the whites into the batter. 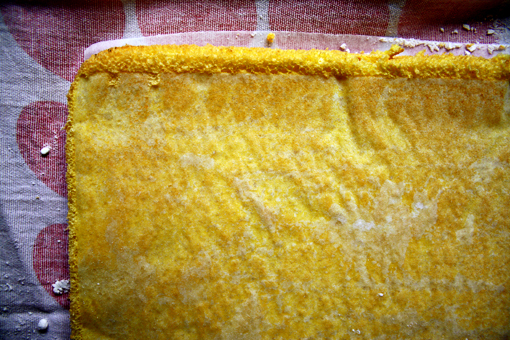 This is basically the main and most important trick about the sponge cakes – to have the batter as light and air-filled as you can manage. And it’s definitely not difficult, no matter what they say. 8. I am using a 12 x 15 inch (30 x 38 cm) baking pan here. Just try to use something similar. 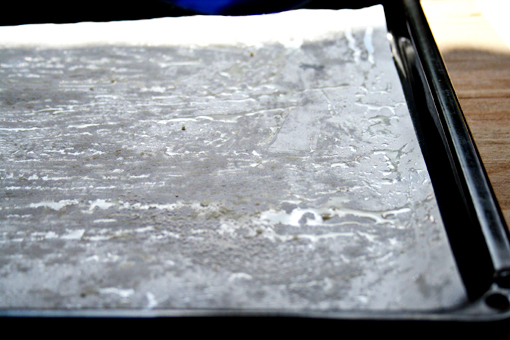 Line your baking pan with parchment paper, and (to stay on the safe side) spray it with some vegetable oil and flour it lightly. 9. Pour the batter into the pan. 10. 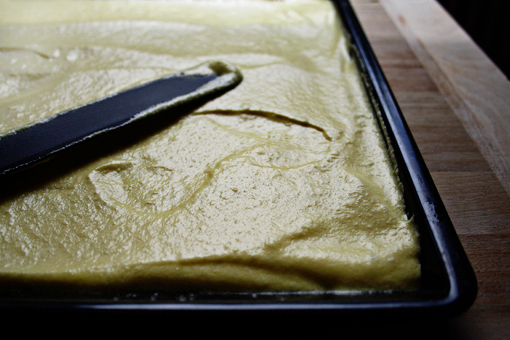 And using an offset spatula or a knife, spread the batter evenly. 11. Bake for 17 minutes or until golden brown. 12. In the meantime, prepare a nice, welcoming home for your cake. Place a clean dish towel on your working surface. 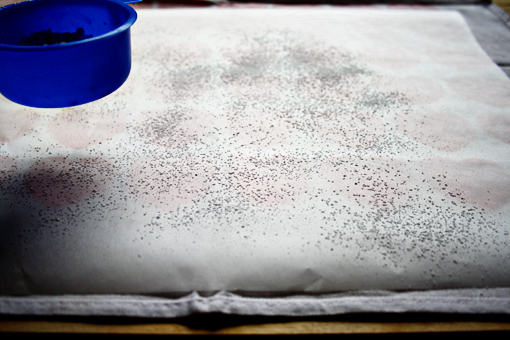 Then put a piece of parchment paper over the towel and sprinkle it with a little of confectioner’s sugar. 13. 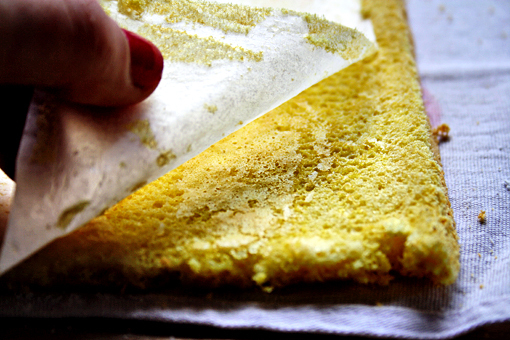 Immediately upon removing the cake from the oven, invert it onto the towel and the paper you have prepared. So now you have the dish towel and the paper underneath the cake and there’s also a piece of paper on top of the cake (the one it was baking with). 14. Carefully, remove the top paper. 15. And, while still hot, roll it up. This way we are making the sponge to get used to being rolled up. If we rolled it up when cooled it might break. 17. 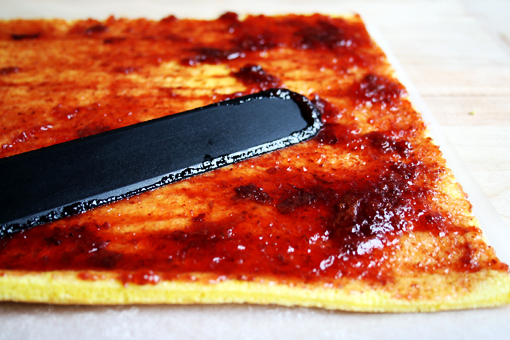 When cooled, unroll the sponge and spread with the preserves (or jam). 18. 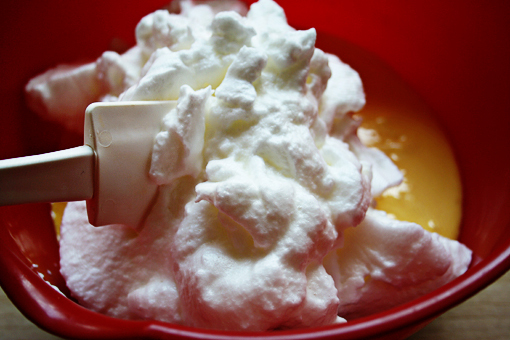 Then whip up the cream. First, beat the cream until soft peaks form, then add 4 tablespoons (30 grams) sugar and continue beating until firm peaks form when the beater is raised. 19. Spread the cream over the preserves. 21. And sprinkle with some more sugar if you wish to. 22. Slice the cake into even 0.6 inch (1.5 cm) pieces. ooh thank you for such detailed pictures and instructions! 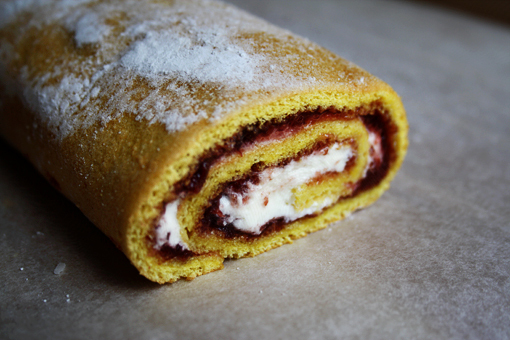 I have wanted to make a roulade for a while now, but have been putting it off because visions of broken cakes scare me off. Looks so elegant and delicious! 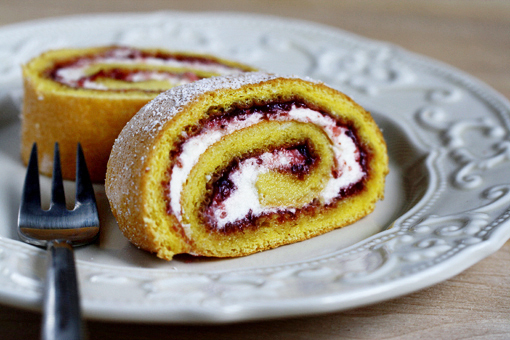 Your roulade looks just scrumptious, with the strawberries and cream. 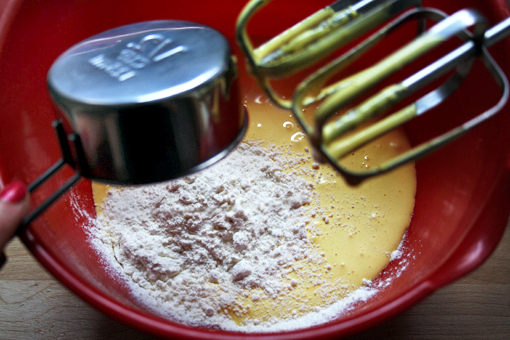 And you make mixing the batter so easy. 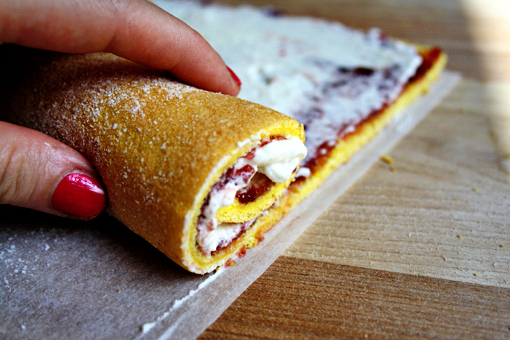 I love pastries that are rolled up and this is a winner! Yummy! I love this cake! I also love your bowls and cute polka dotted towels. Wow. What a breathtaking treat. We made something similar for Daring Bakers, but my cake didn’t quite turn out nearly as perfect as yours. Lovely process photos as usual. 1. you make everything look so easy. Oh! n did I say photography? I want to try everything you post here.. Tried your cheesecake parfait BTW and I’m a hero in my circle already! okay so I tried this today and it didnt turn out as pretty. My 13 yr old son and I tried attacking this recipe together. He accidentally got some yolk in the whites and I was unable to retrieve it so our whites didnt turn out as thick thus our cake was almost crepe like and not sponge cake-like. 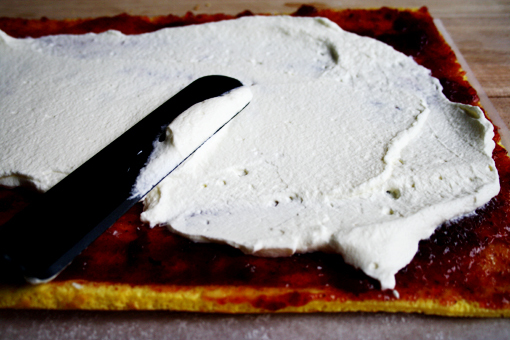 Then, I guess we put too much cream and preserves on the cake because when I rolled it all up it came seeping out. 🙁 I just made a little extra whipped cream and lathered the outside of the roll and then placed fresh strawberries on top to compensate for the “extra”. ha! I made this for my loved ones. Turned out wonderful! Thank you! If I can make this, trust me, the man I love will surely ask me to marry him!! Thank you. You got nice recipe listing and easy to understand cooking procedures. what an excellent recipe!! I’m in the eighties and started baking four years ago. I learned much since then, but I never seen a recipe with such detailed and illustrated instructions, well done!! Not only is it so easy to follow, step by step, it tastes also soooo good. Thank you for the extra effort to illustrate it. What a treat! !